The dwarves need to find an incredibly powerful weapon that will help them in their struggle against the trolls. In order to do this they will need to join forces with five heroes. Will they succeed? It all depends on you! Take a rest from the daily rush! Dive into a long-awaited adventure and find out what happened to Snow White after she defeated the Evil Queen! 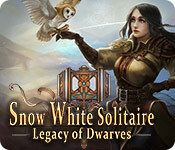 Snow White Solitaire: Legacy of Dwarves is rated 2.8 out of 5 by 12. Rated 5 out of 5 by Kimmycoo from Loved it! I really enjoyed playing this. Make sure to get all of the stars as youll make more coins to buy the rings. I wish it had been longer, but I loved it! Rated 5 out of 5 by Luna_soul from It is hard, but fine! I love this game as well as the first part. Yes, levels more difficult, but it is good! In first part the levels were very simple for me! So, this part is an excellent! Beatiful graphics, music, storyline! I did not find in this part something that I did not like! Rated 5 out of 5 by 2020moonlanding from Relaxing Solitaire The sequel is finally here. 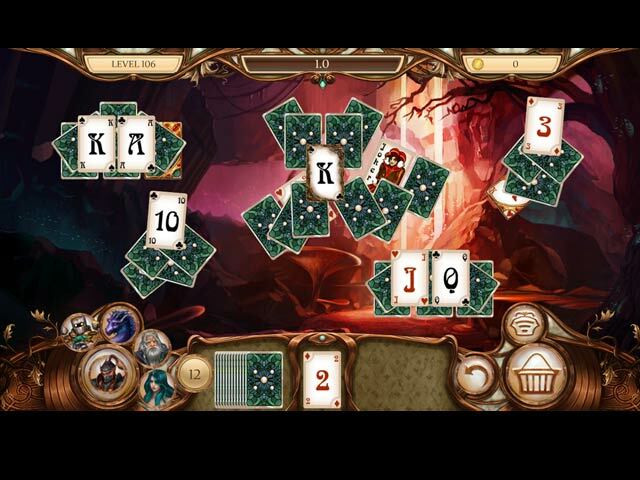 If you loved Snow White Solitaire: Charmed Kingdom you'll love this even more. The gameplay is the same with stones, fire, vines, and ice to break through in order to solve each level. You earn tokens as you progress where you can spend in the shop for power ups. There are three stars to earn in each level and you must earn at least one star in each level before you can move onto the next world. 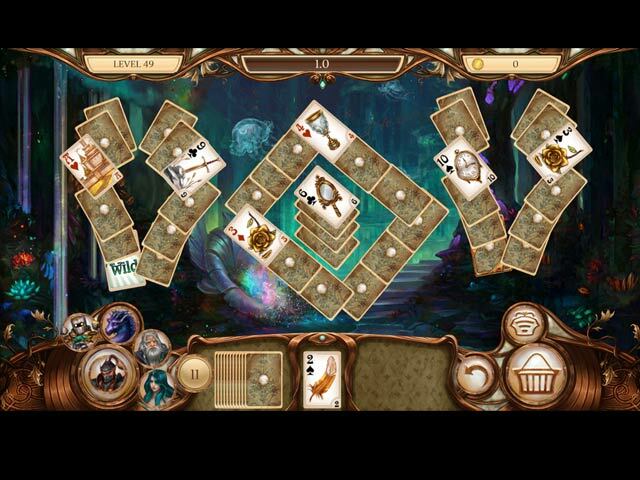 In between levels there are HO scenes to complete as well as dialogue between Snow White and her companions. This is a great game to relax to for the music is incredibly soothing and the gameplay and graphics are stunning. This is a true joy to play. Rated 2 out of 5 by ndl7753 from What a joke!! This is the worst solitaire game I have ever played and have played most put out by bigfish. Many of you know in some games the goal is getting 3 stars per level. If you want to replay some levels over and over again, and I mean over again and still not get the 3 stars, this is the game for you!! Just not fun when everything you try doesn't work to get 3 stars and the upgrades cost a ton and the coins add up very slowly!!! Rated 2 out of 5 by verimeri from sigh I really wanted to like this game. 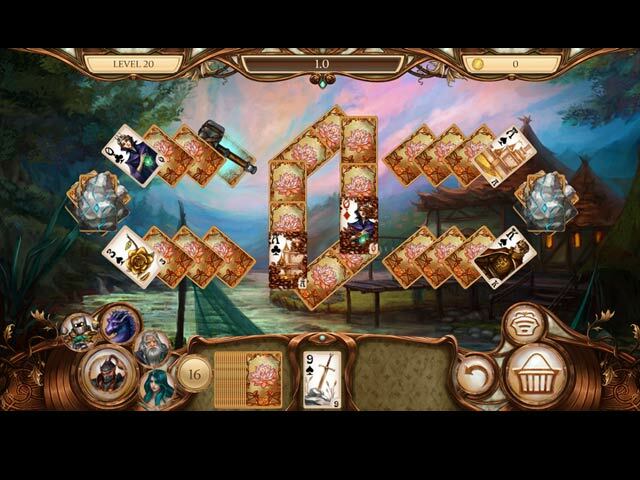 A new solitaire game comes out from Big Fish so seldom. But I have to agree with the other reviewers. There are just not enough cards in the deck to even hope to win most of the levels. Sadly, this is a no buy for me. Rated 2 out of 5 by rainice from Too much work I enjoy a up down solitaire probably as much as any other kind of game, and more than most. I also like a game that's relaxing, that let's you slowly get into the game. With this one though , by the third hand I was already at a level of challenge that I would expect after at least a full hour of playing. If it was already like this after such a short time, what would it become? Too much work to be fun. Rated 2 out of 5 by cowclaudia from Pretty feeble I purchased the previous Snow White solitaire and loved it - this one leaves me cold. Wish I had paid more attention to the thumbs down reviews and have to agree. They don't give you enough cards to clear the board and even with 2 or 3 left over you don't get any stars unlike other solitaire games. And like the previous Snow White it takes a gigantic amount of money to buy any useful power-ups and since you can't get stars on a level it's a slow process. Save your money on this one! Rated 2 out of 5 by CyndiLouWho2 from The first Snow White Solitaire was better For some reason the developer felt the need to make the playing field smaller, which makes the cards smaller. Call me crazy, but I like to see the cards I have to play with. Conversely, the power-up icons at the bottom of the screen don't need to be so huge and I have no idea why the developers felt the need to mess with the graphics. The previous Snow White Solitaire game was much easier on the eyes. I also agree with one of the other reviewers who commented about the huge amount of cards on the playing field and too few on the draw pile. I could understand that happening after many many levels as the game gets more challenging, but not so quickly like it does. Even as a seasoned solitaire player, I was frustrated playing and enjoying this game. If you're a new solitaire player, don't blame yourself if you have difficulties maneuvering through game play -- it's not you. Rated 2 out of 5 by pennydet from Snow White Solitaire: Legacy of Dwarves I thought this would be a good game but they don't give you any cards to play it.You run out of cards before you get started. music was good and story line.Which I could of played it. some one else may have better luck then me. Dive into a fairytale adventure and find out what happened to Snow White after she defeated the Evil Queen!